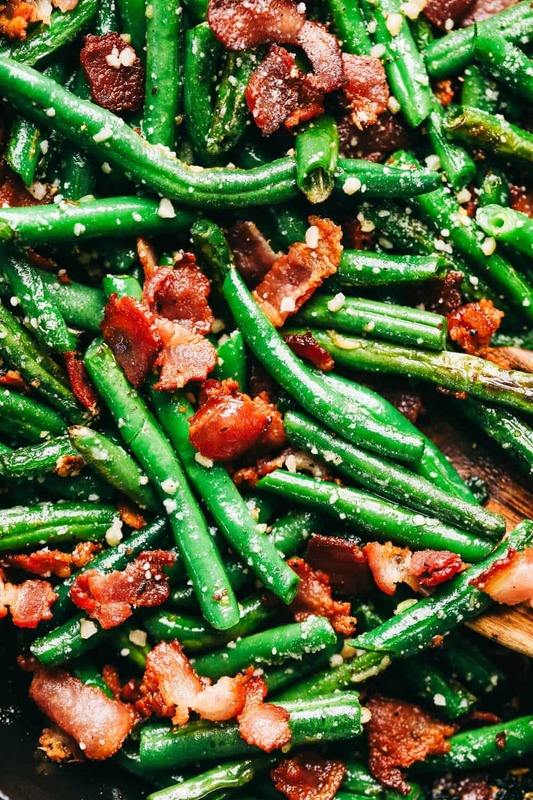 Garlic Parmesan Green Beans with Bacon is such a delicious and classic side dish. 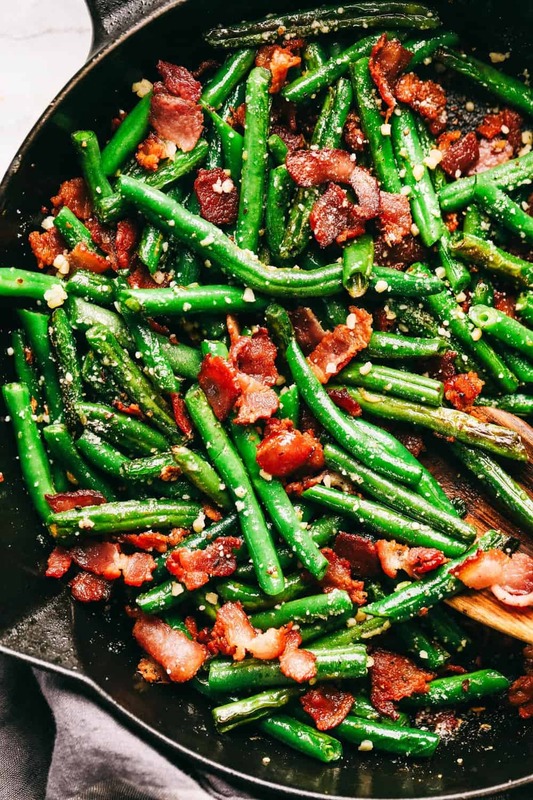 Tender green beans cooked in garlic and parmesan with added bacon will be a winner at the dinner table! This side dish goes perfectly with my Garlic Herb Prime Rib , Spinach Bacon Stuffed Pork, or even this Honey Glazed Ham! Green beans make such a great side to any meal. But when you add garlic, parmesan, and bacon, I could eat this by themself. These green beans were crisp and tender and the flavor is incredible. And let’s be honest. 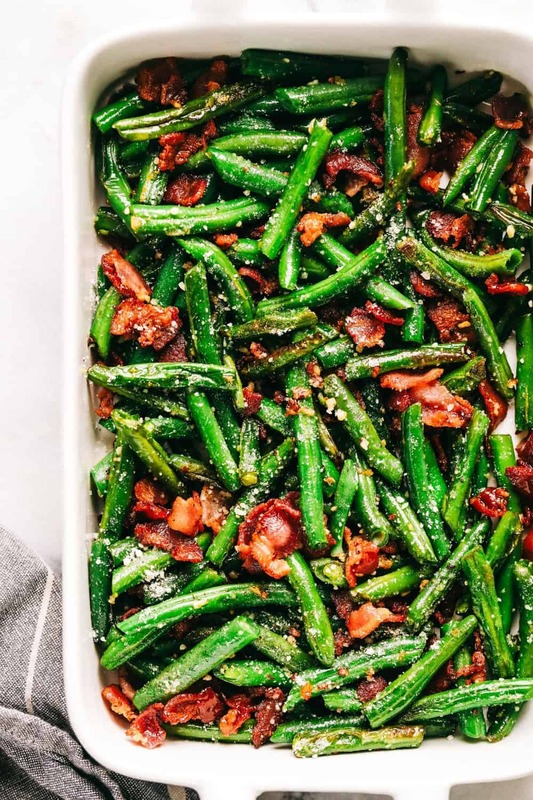 Bacon just makes life better in general so it was a total win in this green bean dish. My family devoured these green beans and they ended up being the star of the dinner table. They are perfect for the holidays and all year long. This will be one of the best green bean recipes that you ever eat! How do I make Garlic Parmesan Green Beans with Bacon? Start by trimming the ends of your green beans and slice into 2 inch pieces. Bring a large pot of water to a boil and add the green beans. Cook until tender 5-8 minutes and drain. Put the green beans in an ice bath. 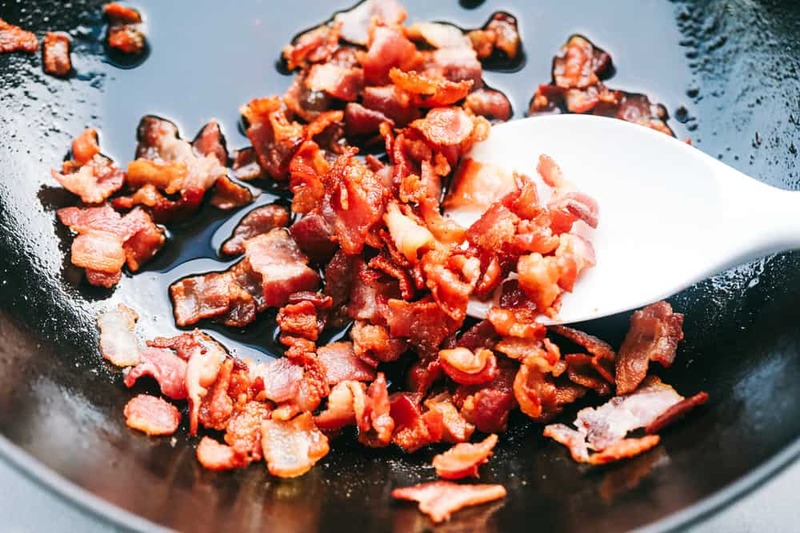 In a medium sized skillet, cook the Diced Bacon until crisp. Remove with a slotted spoon and drain the fat. After draining fat, use the same skillet and add the butter and garlic to the skillet and saute until tender. Add bacon, green beans, and Parmesan cheese to the skillet and cook until heated through. Salt and pepper to taste. There are many ways to prepare fresh Green Beans. Some people like to cut the ends off of green beans, others are just fine without doing so. It’s a matter of personal preference. –To boil fresh Green Beans like I do in this recipe: I cut of the ends of my Green Beans and slice into 2 inch pieces. I then put the Green Beans into a large pot and boil until they are tender (which is typically between 5-8 minutes). –To Saute Green Beans: Start by trimming the Green Beans to your preference. With the Green Beans add a Splash of Oil to a skillet on medium heat with desired spices and stir for about 5 minutes or until tender. -To Steam. With Steaming basket place it into a large sauce pan with water filled level with the bottom of the steamer basket. Bring to a Boil. Add your Trimmed Green Beans to the steamer basket with the lid on, and steam for about 5 minutes or until tender. You want to make sure that you start the process of cooking the bacon. Cook the bacon until it is about half way cooked though and add the green beans in. The grease doesn’t have to be drained, it will help cook the green beans. I like my bacon more on the crispy side, so I cook the bacon pretty crispy and remove it while I am cooking the green beans. I add the bacon back in when the dish is finished. Looking for more holiday side dishes? Look no further! Start by trimming the ends of your green beans and slice into 2 inch pieces. Bring a large pot of water to a boil and add the green beans. Cook until tender 5-8 minutes and drain and put the green beans in an ice bath. In a medium sized skillet cook the bacon until crisp. Remove with a slotted spoon and drain the fat. Add the butter to the skillet and garlic and saute until tender. Add bacon, green beans, and parmesan cheese to the skillet and cook until heated through. Salt and pepper to taste. How long do the green beans stay in the ice bath? Do they need to be dried off before putting back into the skillet? They stay in the ice bath for 5-7 minutes too? what a wonderful way to get green beans into my diet! Bacon pairs well with them in this dish, thank you! My kids love green beans. And of course, who doesn’t love bacon. I am making a new chicken recipe this weekend and I think this green bean recipe will be the perfect side dish. I LIVE BY MYSELF AND FIND IT HARD TO FIND RECIPES FOR ONE PERSON. ARE THERE SUCH THINGS. Yes! Any and all of my recipes can be cut in half for a smaller portion. You can also freeze or have left overs for a few days. Freezing works well with a lot of my recipes and are great to warm up. Hope that helps! Thanks for following along with me!